For other ships with the same name, see HMS Repulse. "Who touches me is broken"
750 ft 2 in (228.7 m) p.p. Repulse participated in the Second Battle of Heligoland Bight in 1917; the only combat she saw during the war. She was reconstructed twice between the wars; the 1920s reconstruction increased her armour protection and made lesser improvements, while the 1930s reconstruction was much more thorough. 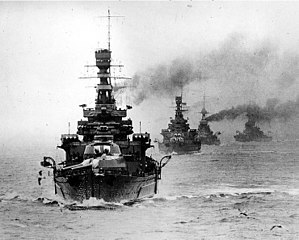 Repulse accompanied the battlecruiser HMS Hood during the Special Service Squadron's round-the-world cruise in 1923–24 and protected international shipping during the Spanish Civil War in 1936–39. The ship spent the first months of the Second World War hunting for German raiders and blockade runners. She participated in the Norwegian Campaign of April–June 1940 and searched for the German battleship Bismarck in 1941. Repulse escorted a troop convoy around the Cape of Good Hope from August to October 1941 and was transferred to East Indies Command. She was assigned in November to Force Z which was supposed to deter Japanese aggression against British possessions in the Far East. Repulse and her consort Prince of Wales were eventually sunk by Japanese aircraft on 10 December 1941 when they attempted to intercept landings in British Malaya. Admiral Lord Fisher first presented his requirements for the new ships to the Director of Naval Construction (DNC) on 18 December 1914, before the ships had even been approved. He wanted a long, high, flared bow, like that on the pre-dreadnought HMS Renown, but higher, four 15-inch guns in two twin turrets, an anti-torpedo boat armament of twenty 4-inch (102 mm) guns mounted high up and protected by gun shields only, speed of 32 knots using oil fuel, and armour on the scale of the battlecruiser Indefatigable. Within a few days, however, Fisher increased the number of guns to six and added two torpedo tubes. Minor revisions in the initial estimate were made until 26 December and a preliminary design was completed on 30 December. During the following week the DNC's department examined the material delivered for the two battleships and decided what could be used in the new design. The usable material was transferred to the builders who had received enough information from the DNC's department to lay the keels of both ships on 25 January 1915, well before the altered contracts were completed on 10 March! Repulse had an overall length of 794 feet 2.5 inches (242.1 m), a beam of 89 feet 11.5 inches (27.4 m), and a maximum draught of 29 feet 9 inches (9.1 m). She displaced 26,854 long tons (27,285 t) at normal load and 31,592 long tons (32,099 t) at deep load. The Brown-Curtis direct-drive steam turbines were designed to produce 112,000 shaft horsepower (84,000 kW), which would propel the ship at 32 knots (59 km/h; 37 mph). However, during trials in 1916, Repulse's turbines provided 118,913 shp (88,673 kW), allowing her to reach a speed of 31.73 knots (58.76 km/h; 36.51 mph). The ship normally carried 1,000 long tons (1,016 t) of fuel oil, but had a maximum capacity of 4,289 long tons (4,358 t). At full capacity, she could steam at a speed of 18 knots (33 km/h; 21 mph) for 4,000 nautical miles (7,410 km; 4,600 mi). The ship mounted six 42-calibre BL 15-inch Mk I guns in three twin hydraulically powered gun turrets, designated 'A', 'B', and 'Y' from front to rear. Her secondary armament consisted of 17 BL 4-inch Mark IX guns, fitted in five triple and two single mounts. Repulse mounted a pair of QF 3-inch 20 cwt[Note 1] anti-aircraft guns mounted on the shelter deck abreast the rear funnel. She mounted two submerged tubes for 21-inch (533 mm) torpedoes, one on each side forward of 'A' barbette. Repulse's waterline belt of Krupp cemented armour measured 6 inches (152 mm) thick amidships. Her gun turrets were 7–9 inches (178–229 mm) thick with roofs were 4.25 inches (108 mm) thick. As designed the high-tensile-steel decks ranged from 0.75 to 1.5 inches (19 to 38 mm) in thickness. After the Battle of Jutland in 1916, while the ship was still completing, an extra inch of high-tensile steel was added on the main deck over the magazines. Repulse was fitted with a shallow anti-torpedo bulge integral to the hull which was intended to explode the torpedo before it hit the hull proper and vent the underwater explosion to the surface rather than into the ship. Despite these additions, the ship was still felt to be too vulnerable to plunging fire and Repulse was refitted in Rosyth between 10 November 1916 and 29 January 1917 with additional horizontal armour, weighing approximately 504 long tons (512 t), added to the decks over the magazines and over the steering gear. Repulse was the first capital ship fitted with a flying-off platform when an experimental one was fitted on 'B' turret in the autumn of 1917. Squadron Leader Frederick Rutland took off in a Sopwith Pup on 1 October. Another platform was built on 'Y' turret and Rutland successfully took off from it on 8 October. One fighter and a reconnaissance aircraft were normally carried. Repulse was laid down by John Brown, Clydebank, Scotland on 25 January 1915. The ship was launched on 8 January 1916 and completed on 18 August 1916, after the Battle of Jutland. Her construction cost £2,829,087 (£ 155,720,000 in 2019). She served with the Grand Fleet in the North Sea during the remaining two years of the First World War. Repulse relieved HMS Lion as flagship of the 1st Battlecruiser Squadron for the duration of the war. Over the course of 1917 the Admiralty became more concerned about German efforts in the North Sea to sweep paths through the British-laid minefields intended to restrict the actions of the High Seas Fleet and German submarines. A preliminary raid on German minesweeping forces on 31 October by light forces destroyed ten small ships and the Admiralty decided on a larger operation to destroy the minesweepers and their escorting light cruisers. Based on intelligence reports the Admiralty decided on 17 November 1917 to allocate two light cruiser squadrons, the 1st Cruiser Squadron covered by the reinforced 1st BCS (less Renown) and, more distantly, the battleships of the 1st Battle Squadron to the operation. The German ships, four light cruisers of II Scouting Force, eight destroyers, three divisions of minesweepers, eight Sperrbrechers (cork-filled trawlers, used to detonate mines without sinking) and two trawlers to mark the swept route, were spotted at 7:30 a.m.,[Note 2] silhouetted by the rising sun. The light battlecruiser Courageous and the light cruiser Cardiff opened fire with their forward guns seven minutes later. The Germans responded by laying an effective smoke screen. The British continued in pursuit, but lost track of most of the smaller ships in the smoke and concentrated fire on the light cruisers as opportunity permitted. Repulse was detached not long after and raced forward at full speed to engage the enemy ships. She opened fire at about 9:00, scoring a single hit on the light cruiser SMS Königsberg during the battle. When the German battleships SMS Kaiser and SMS Kaiserin were spotted about 9:50 the British broke off their pursuit and Repulse covered their retreat, aided by a heavy fog that came down around 10:40. The ship fired a total of 54 15-inch shells during the battle and scored one hit on the light cruiser SMS Königsberg that temporarily reduced her speed. On 12 December 1917, Repulse was damaged in a collision with the battlecruiser HMAS Australia. The ship was present at the surrender of the High Seas Fleet at Scapa Flow on 21 November 1918. Repulse began a major refit at Portsmouth on 17 December 1918 intended to drastically improve her armour protection. Her existing six-inch armour belt was replaced by nine-inch (229 mm) armour plates made surplus by the conversion of the battleship Almirante Cochrane (originally ordered by Chile and purchased after the war began) to the aircraft carrier HMS Eagle. The original armour was fitted between the main and upper decks, above the new armour. Additional high-tensile plating was added to the decks over the magazines. The ship's anti-torpedo bulge was deepened and reworked along the lines of that installed on the battleship HMS Ramillies. The bulge covered her hull from the submerged torpedo room to 'Y' magazine and the inner compartments of which were filled with crushing tubes. The bulges added 12 feet 8 inches (3.9 m) to her beam and 1 foot 4 inches (0.4 m) to her draught. The refit added about 4,500 long tons (4,600 t) to her displacement and raised her metacentric height to 6.4 feet (2.0 m) at deep load. Three 30-foot (9.1 m) rangefinders were also added as well as eight torpedo tubes in twin mounts on the upper deck. Both flying-off platforms were removed. This refit cost £860,684. Repulse was recommissioned on 1 January 1921 and joined the Battlecruiser Squadron of the Atlantic Fleet. In November 1923, Hood, accompanied by Repulse and a number of Danae-class cruisers of the 1st Light Cruiser Squadron, set out on a world cruise from west to east via the Panama Canal. They returned home ten months later in September 1924. Shortly after her return the ship's pair of three-inch AA guns and her two single four-inch gun mounts were removed and replaced with four QF four-inch Mark V AA guns. The Battlecruiser Squadron visited Lisbon in February 1925 to participate in the Vasco da Gama celebrations before continuing on the Mediterranean for exercises. A squash court was added on the starboard side between the funnels for the Prince of Wales' tour of Africa and South America that lasted from March to October. Upon her return she was refitted from November 1925 to July 1926 and had a high-angle control position (HACP) added to her fore-top. After Repulse completed her 1926 refit she remained in commission, aside from a brief refit in July–September 1927, with the Battlecruiser Squadron of the Atlantic Fleet until she was paid off in June 1932 prior to beginning her reconstruction in April 1933. Most of the existing layers of high-tensile steel that constituted the ship's horizontal armour were replaced by non-cemented armour plates 2.5–3.5 inches (64–89 mm) in thickness and the torpedo control tower was removed from the aft superstructure. A fixed catapult replaced the midships 4-inch triple mount and a hangar was built on each side of the rear funnel to house two of the ship's Fairey III aircraft. One additional aircraft could be carried on the deck and another on the catapult itself. Electric cranes were mounted above each hangar to handle the aircraft. The four 4-inch AA guns were moved, one pair abreast the rear funnel at the level of the hangar roof and the other pair abreast the fore funnel on the forecastle deck. Four prototype QF 4-inch Mark XV dual-purpose guns were added in twin-gun Mark XVIII mounts abreast the mainmast. Two octuple Mark VI 2-pounder mounts were fitted on extensions of the conning-tower platform abreast the fore funnel. Above these a pair of quadruple Mark II* mountings for the 0.5-inch Vickers Mark III machine gun were added. These mounts could depress to −10° and elevate to a maximum of 70°. The machine guns fired a 1.326-ounce (37.6 g) bullet at a muzzle velocity of 2,520 ft/s (770 m/s). This gave the gun a maximum range of about 5,000 yd (4,600 m), although its effective range was only 800 yd (730 m) Repulse received two High-Angle Control System anti-aircraft directors, one Mark II on the fore-top and a Mark I* mounted on a pedestal above the rear superstructure. The two submerged torpedo tubes were removed and the vacant spaces sub-divided and turned into store-rooms. Repulse was assigned to the Mediterranean Fleet when she recommissioned in April 1936. She transported 500 refugees from Valencia and Palma, Majorca to Marseilles, France in late 1936 after the start of the Spanish Civil War. The ship was present at the Coronation Fleet Review at Spithead on 20 May 1937 for George VI. Repulse was sent to Haifa in July 1938 to maintain order during the Arab Revolt. She was selected to convey the King and Queen during their May 1939 Canadian Tour and she was refitted between October 1938 and March 1939 for this role. The twin 4-inch AA guns were replaced by two more Mark V guns and two additional quadruple .50-calibre mounts were added. The King and Queen ultimately travelled aboard the liner RMS Empress of Australia while Repulse escorting them on the first half of the journey. At the beginning of the Second World War Repulse was part of the Battlecruiser Squadron of the Home Fleet. She patrolled off the Norwegian coast and in the North Sea in search of German ships and to enforce the blockade for the first couple months of the war. Early in the war the aft triple 4-inch gun mount was replaced with an 8-barrel 2-pounder mount. In late October she was transferred to Halifax with the aircraft carrier HMS Furious to protect convoys and search for German raiders. Repulse and Furious sortied from Halifax on 23 November in search of the German battleship Scharnhorst after it had sunk the armed merchant cruiser HMS Rawalpindi, but the Repulse was damaged by heavy seas in a storm and was forced to return to port. Repulse escorted the convoy bringing most of the 1st Canadian Infantry Division to Britain 10–23 December 1939 and was reassigned to the Home Fleet. In February 1940 she accompanied the aircraft carrier HMS Ark Royal on a fruitless search for six German blockade runners that had broken out of Vigo, Spain. Repulse was assigned to support Allied operations during the Norwegian Campaign in April–June 1940. On 7 April, Repulse, along with the bulk of the Home Fleet, was ordered to sea to intercept what was thought to be another attempt to break-out into the North Atlantic. The ship was detached the following day to search for a German ship reported by the destroyer HMS Glowworm, but the destroyer had been sunk by the German cruiser Admiral Hipper before Repulse arrived and she was ordered to rendezvous with her sister Renown south of the Lofoten Islands, off the Norwegian coast. On 12 April Repulse was ordered to return to Scapa Flow to refuel and she escorted a troop convoy upon her return. In early June the ship was sent to the North Atlantic to search for German raiders and played no part in the evacuation of Norway. Accompanied by Renown and the 1st Cruiser Squadron, Repulse attempted to intercept the German battleship Gneisenau as it sailed from Trondheim to Germany in July. Until May 1941 the ship escorted convoys and unsuccessfully searched for German ships. On 22 May Repulse was diverted from escorting Convoy WS8B to assist in the search for the German battleship Bismarck, but she had to break off the search early on 25 May as she was running low on fuel. The ship was refitted from June to August and received eight Oerlikon 20-millimetre (0.79 in) autocannon as well as a Type 284 surface gunnery radar. Repulse escorted a troop convoy around the Cape of Good Hope from August to October and was transferred to East Indies Command. In late 1941 Winston Churchill decided to send a small group of fast capital ships, along with one modern aircraft carrier to Singapore, to deter expected Japanese aggression. In November, Repulse which was in the Indian Ocean was ordered to Colombo, Ceylon to rendezvous with the new battleship HMS Prince of Wales. The carrier HMS Indomitable, which was assigned to join them, was delayed when she ran aground in the Caribbean. Prince of Wales and Repulse and their escorting destroyers comprised Force Z, which arrived in Singapore on 2 December 1941. On the evening of 8 December, Force Z departed for an attempt to destroy Japanese troop convoys and protect the army's seaward flanks from Japanese landings in their rear. Force Z was spotted during the afternoon of 9 December by the Japanese submarine I-65 and floatplanes from several Japanese cruisers spotted the British ships later that afternoon and shadowed them until dark. Admiral Sir Tom Phillips decided to cancel the operation as the Japanese were now alerted. Force Z turned back during the evening, after having tried to deceive the Japanese that they were heading to Singora. At 00:50 on 10 December Admiral Philips received a signal of enemy landings at Kuantan and correspondingly altered course so that he would arrive shortly after dawn. The crew of I-58 spotted Force Z at 02:20, reported their position, and fired five torpedoes, all of which missed. Based on this report the Japanese launched 11 reconnaissance aircraft before dawn to locate Force Z. Several hours later 86 bombers from the 22nd Air Flotilla based in Saigon were launched carrying bombs or torpedoes. The crew of a Mitsubishi G3M "Nell" reconnaissance bomber spotted the British at 10:15 and radioed in several reports. The pilot was ordered to maintain contact and to broadcast a directional signal that the other Japanese bombers could follow. The first attack began at 11:13 when 250 kilograms (551 lb) bombs were dropped from eight G3Ms from an altitude of 11,500 feet (3,505 m). The battlecruiser was straddled by two bombs, then hit by a third which penetrated through the hangar to explode on the armoured deck below. This inflicted a number of casualties and damaged the ship's Supermarine Walrus seaplane, which was then pushed over the side to remove a fire hazard. Anti-aircraft fire damaged five of the Japanese bombers, two so badly that they immediately returned to Saigon. In the ensuing attacks, Repulse was skilfully handled by her captain, Bill Tennant, who managed to avoid 19 torpedoes as well as the remaining bombs from the G3Ms. However, Repulse was then caught by a synchronised pincer attack by 17 Mitsubishi G4M torpedo bombers and hit by four or five torpedoes in rapid succession. The gunners on the Repulse shot down two planes and heavily damaged eight more, but the torpedo damage proved fatal. At 12:23 Repulse listed severely to port and quickly capsized with the loss of 508 officers and men. The destroyers HMS Electra and HMAS Vampire rescued the survivors. The wreck site was designated as a 'Protected Place' in 2002 under the Protection of Military Remains Act 1986, 60 years after her sinking. Survivors described five torpedo hits on Repulse, four on the port side and one on the starboard side. The four portside hits purportedly were: two amidship, one abreast of the rear turret and one near the propellers. The starboard side hit was amidships. A 2007 diving expedition  could confirm only two of the hits by examination of the wreck: the portside hit near the propellers and the starboard hit amidship. Unfortunately, at the time of the expedition, the portside midships section of the wreck was buried in the ocean floor thus the claimed hits there could not be confirmed. However, the area abreast of the port rear turret was accessible though and no sign whatsoever of a torpedo hit - as described by survivors - was found to be there. In October 2014, the Daily Telegraph reported that both Prince of Wales and Repulse were being "extensively damaged" with explosives by scrap metal dealers. ^ "British 0.50"/62 (12.7 mm) Mark III – Japanese 12 mm/62 "HI" Type". navweaps.com. 27 January 2010. Archived from the original on 7 February 2010. Retrieved 8 June 2010. ^ "Statutory Instrument 2006 No. 2616 The Protection of Military Remains Act 1986 (Designation of Vessels and Controlled Sites) Order 2006". Queen's Printer of Acts of Parliament. Archived from the original on 8 July 2008. Retrieved 20 November 2009. ^ Julian Ryall, Tokyo and Joel Gunter (25 October 2014). "Celebrated British warships being stripped bare for scrap metal". Daily Telegraph. Archived from the original on 26 October 2014. Retrieved 26 October 2014. Campbell, N. J. M. (1978). Battle Cruisers: The Design and Development of British and German Battlecruisers of the First World War Era. Warship Special. I. Greenwich: Conway Maritime Press. ISBN 0-85177-130-0. Denlay, Kevin (2007). "Expedition Job 74" (PDF). explorers.org. Retrieved 6 June 2013. Haarr, Geirr H. (2010). The Battle for Norway: April–June 1940. Annapolis, MD: Naval Institute Press. ISBN 978-1-59114-051-1. Haarr, Geirr H. (2009). The German Invasion of Norway: April 1940. Annapolis, MD: Naval Institute Press. ISBN 978-1-59114-310-9. Newbolt, Henry (1996) . Naval Operations. History of the Great War Based on Official Documents. V (repr. ed.). Nashville, TN: Battery Press. ISBN 0-89839-255-1. Parkes, Oscar (1990) . British Battleships (repr. ed.). Annapolis, Maryland: Naval Institute Press. ISBN 1-55750-075-4. Raven, Alan; Roberts, John (1976). British Battleships of World War Two: The Development and Technical History of the Royal Navy's Battleships and Battlecruisers from 1911 to 1946. Annapolis, Maryland: Naval Institute Press. ISBN 978-0-87021-817-0. Stephen, Martin (1988). Sea Battles in Close-Up: World War 2. Annapolis, Maryland: Naval Institute Press. ISBN 0-87021-556-6. Brown, Cecil. Suez to Singapore, (Google Books), Random House, New York: 1942, OCLC 396440. Hein, David. "Vulnerable: HMS 'Prince of Wales' in 1941". Journal of Military History Volume 77, no. 3 (July 2013): pp. 955–989, ISSN 0899-3718. Wikimedia Commons has media related to HMS Repulse. This page was last edited on 13 March 2019, at 22:10 (UTC).